Navigation: Home » Economics » How Many Accredited Investors and Households Are There in America? 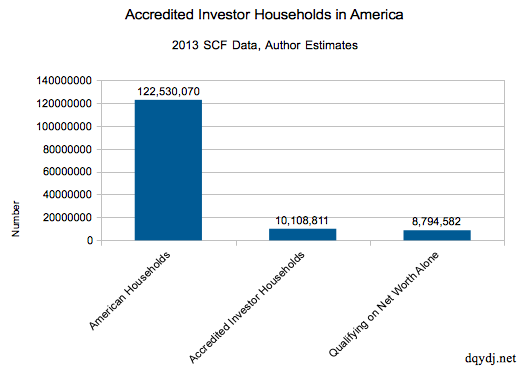 How Many Accredited Investors and Households Are There in America? We estimate that 8.25% of all American households – or roughly 10,108,811 households – count as Accredited Investors. (As of 2013, calculated using Federal Reserve SCF microdata). Further, they hold about 70.28% of all private wealth in this country, or a whopping $45.5 trillion. Let’s back up for a second for everyone not coming for the one liner: what is an accredited investor? Is it a good financial aspiration to become an accredited investor? How did we calculate this number? And, most importantly – why would you want to be an accredited investor? Editor: See the number of accredited investors in America in 2016 (updated data). What are Accredited Investors? How Do You Qualify? For the strict definition, you can read verbatim from the code of federal regulations, specifically the Securities Act of 1933, §230.501, terms and definitions. (or) One member of the household earning $200,000 the last two straight years and expecting it to continue in the current year. The law specifically calls out net worth in the equation – and, from our study, we found that it is actually the most important requirement for individuals. There are about 8.8 million households who can qualify based upon the net worth requirement alone, meaning only around 1.3 million households need the income based qualification to gain Accredited Investor status. Accredited Investors: An estimate of American households qualifying. What Can You Do as an Accredited Investor? Normally the SEC requires that companies and private funds have to register security offerings with the SEC and mandates specific disclosures. Alternatively, once an investor qualifies as an Accredited Investor, that investor can then invest in private placements. That includes things such as venture capital funds, angel investments, hedge funds, and other private placements (notably too, franchises). As for how to invest in a hedge fund or one of those other funds – well, until recently, you were on your own in finding them through word of mouth – it was only recently that solicitation was allowed in certain cases for private placements. Even so, hedge funds typically have their own limits – typically, most hedge funds weigh in with about a million dollar minimum investment (or more), with a few ‘lite’ type funds around in the low six digit range. Is Being an Accredited Investor a Good Aspiration For Your Finances? Absolutely, yes it is – considering only around 8.25% of all American households hold the status, it’s a great aspirational target to try to become accredited. That doesn’t mean reaching Accredited Investor status on its own means you can retire comfortably in every geography in America (I’m looking at you, San Francisco, New York and Washington, D.C.! ), it does put you in a good situation versus the average household’s finances. Just like the caveats about it maybe being a bit light on the coasts, as I mentioned, private funds can set their own limits on investments they will allow into their funds. Note that in some areas of investing, there is a social aspect to being allowed to invest – you can find ratings of investors in some fields (like Angel Investing). Typically, funds and early stage companies can set requirements on minimum investment size, past experience required, past investment experience needed, net worth above and beyond the minimum accredited investor requirements, and even territorial requirements (as in franchises). But, if you’re new to the territory – you still need to get the Accredited Investor “ticket”. Call it “necessary but not sufficient”. We used microdata for the 2013 Survey of Consumer Finances from the Federal Reserve. We detailed how we imported and imputed the data in this post on how income doesn’t predict wealth well. Normal Income and Income should cover the last two years of income requirement, so if there is a loss of income the non-net worth qualified households might be a bit high of an estimate. That said, it’s possible I missed on the low side too – consider a household where both adults work, where one makes say $20,000 and the other $210,000… as it’s less than $300,000 total, this quick cut would miss that. But, hey, net worth dominates anyway – these numbers are pretty good. Although aiming to become an accredited investor is a pretty good start (and gets your access to the riskiest – and therefore highest potential return – investments), the entry level portfolios of the accredited likely look a lot like the portfolios of the non-Accredited. Because private placement investment minimums can still be pretty high, many accredited investors don’t have too many of these investment types in their portfolios. Still, we think that most readers of this site will agree – becoming an Accredited Investor is a pretty good goal for your household finances, especially on the net worth side of the equation. If you’re looking for financial independence or retirement in one of the salt-water states, you might not have completely punched your ticket – but it’s a pretty solid hurdle to clear in your journey. What do you think about the Accredited Investor Requirements? Did you expect 8.25% of American households to qualify as accredited investors? Have you considered investing in hedge funds or other opportunities only open to the accredited? So given your data we can also conclude that over 8% of households in the US are millionaires? I was going to say that seemed high versus other estimates I’ve seen given your data is excluding primary residence. But then I went and found one of those other estimates and read that they too excluded primary residence. I’d have thought that they’d’ normally include primary residence in figuring the # of millionaires but apparently not. A bit closer to 7 – around 7.1%. But, hold that thought though – I might roll back into the data at some point and try to quantify some better numbers, perhaps even taking a few shots at coming up with a value for periodic payments. It was more than I would had guessed. But I think it is flawed that the regulators that came up with this definition consider those that meet the accredited investor criteria are automatically more informed and understand the risk they are taking on. Which I think you and I know is not always the case. It also meant a lot more back when the definitions were first made – inflation adjusted, you’d be looking at multiples of those numbers today. An experience or quiz based definition would be interesting – we’ll see how the crowdfunding type approaches end up shaking out.